A pub in Wedding, Saturday night or is it Sunday morning already? Three grumpy men in Lederhosen drink their beer in silence at a table in the corner. At the same time you can see two guys in black’n’yellow at the bar, singing Drafi Deutscher’s megahit “Jenseits von Eden” from the bottom of their hearts. The regulars join in and the Chorus “Dann haben wir umsonst gelebt…” (Then we have lived in vain…) fills the room. What has happened in Berlin on this Saturday night that made the black’n’yellows sing and the Lederhosen look like they are really living in vain? Well, there was the cup final this Saturday, wasn’t it? But the mighty Borussia lost another final against their Bavarian rivals. Still the Borussians in the pub are chanting, while the Lederhosen are staring into their beers with empty eyes. Why are the losers singing? Why is nobody celebrating the Bavarian triumph? Find out about the emotions of a lost final and the way to celebrate a fantastic season despite losing the final fight in our match report. If something is taken from you that you truly deserve, bitterness, anger and sadness dominate your feelings in the beginning. Shortly after though, the fighting spirit and the bounce-back ability - that all Borussen have - returns and we all realize that this final and the way in which we lost it will only make us return stronger and more determinate! Even two days after the loss the negative connotation won't fly away. Don't get me wrong, losses belong to football as much as Kevin Großkreutz belongs to Dortmund, but it are the circumstances that leave me still here in front of my computer, feeling totally empty. For the second time in less than a year a miserable performance of the referees guide the outcome into a certain direction. What if Ribery would have been booked for his conduct? 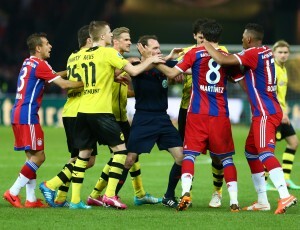 What if Dante would have got his second yellow card after he fouled Reus? What if Meyer would have recognized the goal? What if Meyer would have seen Rafinha fouling Piszczek within the box? It will surely take a few more days to close this case. We'll be back. No matter what. So that was it, the highly anticipated cup final. What remains eventually? A lot of disappointment because our great team was not awarded for fighting for 120 minutes until the end and for another great performance. A lot of disbelief, and this disbelief can be seen on various sides. On the one hand disbelief for the people – and especially clubs - still positioning themselves against goal line technology. How many proves do we need to finally use that feature that could be used without any big obstacles to prevent scenes like Hummels’ goal not being awarded from happening – even though it is clear that goal line technology would not have been used in the final even when the clubs decided differently a few months ago. Disbelief on the other hand could be felt concerning the winners of the cup. Especially when you take the comparison to our big triumph in 2012, I cannot imagine that a cup victory could be celebrated this awkwardly, on the pitch as well as on the stands. What also remains, however, is the yet most important recognition: I do not want to be anything else than a supporter of Borussia Dortmund. It is always a great feeling to meet familiar faces everywhere. On the toilet, in the stadium, in the city, at Gedächtniskirche in Berlin, even on traffic islands. And when you have a coach like Jürgen Klopp at the side lines who has this special feeling to search the contact with the supporters in the exact right moments, then every defeat becomes bearable. The second-placed team in the DFB cup had its own and well deserved celebration time. The feeling that remains eventually, can be summarized in one word: pride! It is rather simple to make fun of the Bavarian style of celebrating a win in the cup final. Singing two or three songs within the 20 minutes from the final blow of the whistle until the actual receivement of the cup is far away from ecstasy, given in particular that the direction in the stadium had the weird idea of letting 30 guys in orange and grey running around the pitch for minutes. For whatever reason. Most ironic, though, is that at some time within the lap of honour of our beloved guys in black and yellow some golden lametta came falling down the roof, indicating that the cup must have changed the current owner. It literally couldn't be heard, as thousands of Dortmund supporters were cheering simultaneously. Still, during the game the support was rather poor, at least from my point of view (and given that we were in the home stands this year). Already downtown during the day, the number of dead drunk people was incredibly high, and also within the stadium I was confronted with a large portion of guys for which a cup final was not that important that one would have wanted to watch it sober (at least partially) and singing and cheering. I still don't really get why the event of being in Berlin is so important compared to actually watching the game. Given the tremendous number of people who would have loved to get tickets for the final, I think a bit more passion and a bit less partying would be a good combination for future finals. Even if in comparison to the opponent things are way better. Even a few days later I still find this final defeat hard to take, probably even harder than last year's because this time the important decision against us were even more obvious. So this was the fourth final I was able to watch live and we lost three of those against Bayern. All I am hoping for next time whenever we make a final again is that maybe for once we can play someone else! A team whose fans wouldn't walk out during their team's celebrations because it's nothing special to them anymore. I'd never want to get to that point where winning a trophy is not special anymore! And just maybe we are lucky to make a final for a fourth year in a row and Kehl can finish his career with an ending he would deserve! Now three days have passed but all the pictures from Berlin's Olympiastadion are still in my mind. To be honest I would never complain about a 0:1 defeat against Buyern after 90 minutes of regular playtime. A win was possible for both teams but the 2:0 win for Buyern after additional playtime leaves a very bitter taste in my mouth. A regular goal of Mats Hummels was stolen from us and to complete the whole affair, this regular goal wasn't shown on the stadiums big screens when they presented the highlights after the final whistle. I'm sure the responsible staff knew exactly why Mat's Hummels goal was deleted in this video summary. It fits exactly to the way how the "almighty" Buyern won their second final in a row against our club. But what can we do now? Beside grumbling and getting upset, absolutely nothing. Sad but true! Our only hope is that next season will be the chance for a revenge, in the league or maybe in the cup or maybe even in the Champions League. And for a revenge we don't need the help of referees or officials! Let's give the answer to Buyern on the pitch! There's a saying that one man swinging his sword one time does not win a battle. In a less militaristic scenario, I had a youth football coach that said "you can never blame a loss or a victory on one event." It's not about the missed goal or the bad pass; it's a series of events in an entire match that can be to blame for a win or a loss. Those goals or baskets or home runs or touchdowns just get the headline blame or credit, but there are eighty-nine minutes and fifty-five seconds in a match that can be just as responsible for victory or defeat. That's an awfully challenging amount of maturity to ask of one when reflecting on the Pokalfinale results in Berlin, even a few days after the match. I have gone through all five stages of grief from the Kübler/Ross model since Saturday. 1) Denial ("there's no way this can REALLY be the result. Objectively, smart people cannot let this happen, right?. We are the rightful victors, no? "); to 2) Anger - be it at Dante, Neuer, the line judge, Florian Meyer, Javi, the DFB- you name it; to 3) Bargaining ("I mean.MAYBE Hummels was offsides.I haven't seen any proof, but maybe?") to 4) Depression; and then finally, 5) Acceptance. Football, bloody hell. Regardless, this still stings and it's easy to complain about how wrong the final result really was. The bully on the communal playground sucker-punched us and took our lunch money and, worst of all, they glibly pretended they earned it this year. It's easy to be full of self-pity about how life isn't fair, but guess what? Life isn't fair. Political history is full of people who purchase and scheme for power instead of earning it. As a participant/observer from far away, I found myself feeling the same as I did after the Wembley Champions' League match last year. I wish I was there. 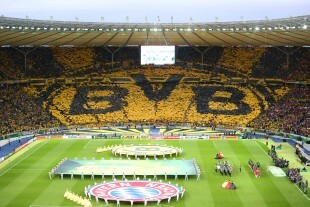 I sang to the team after the 3-0 loss to Bayern in November, and that is something that defines being a BVB supporter. There is undeniable pride in working for your achievements, in success against adversity, and in deriving strength from your losses or your misses. This season was an arduous experience and after the dramatic ups and downs, it made everyone stronger. We have every reason to believe that 2015 can end with two matches in Berlin yet again. Now, at the end of our match report, let’s get back to the story at the beginning. Who were the two Borussian’s in Wedding and why were they partying so much after such a big defeat? I have to admit that these two Schlager-singing drunkards were no other than me and fellow sg.com-editor Steph. But why were we singing, while the grumpy Bavarians sat aside and stared at the wall? The answer is pretty simple: Because we are nothing like them. They are replete with titles, we are always hungry for Borussia. They are living in fear, fear of losing every once in a while. We know that Borussia is about so much more than winning. It is about organizing the Borussia Hearts Club on the day before the match and meeting friends from all over Europe there. Some of them even travelled vast distances without holding a ticket to the match, just to celebrate the fact, that we have reached another final. It is about meeting tens of thousands Borussians at the Gedächtniskirche. It is about sporting your colours with pride away from home. And it is about acknowledging the fact that we are lucky enough to witness the best times our club has seen so far. In the last four years we won two championships and came in 2nd for another two times. Additionally we reached 3 finals and won one of them. 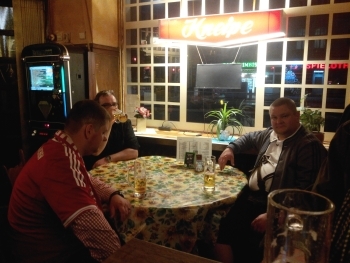 For some it takes a bit longer after a lost final to realize these great and unprecedented achievements, for some of us it takes only a couple of beers, some Schlager-music and some grumpy Bavarians to remember that being a true Borussian is as good as it gets. So we celebrated our team and our club the night after a lost final until the sun came up, knowing that no matter how many trophies they collect, these Bavarians will never experience a night like this.